Dime Novel Legends is close to Kickstarter goal! Good news! Chicken Fried Toys’ Dime Novel Legends Kickstarter Project is almost funded with 17 days remaining! We’re close! We’re really close! The amazing Western-themed Dime Novel Legends Kickstarter is within spitting distance of crossing the line into fully-funded territory. With 17 days remaining this is not only doable but it also means that stretch goals have a good chance of becoming unlocked. All it takes is for more people to jump on board the wagon and throw some support to this incredible line! 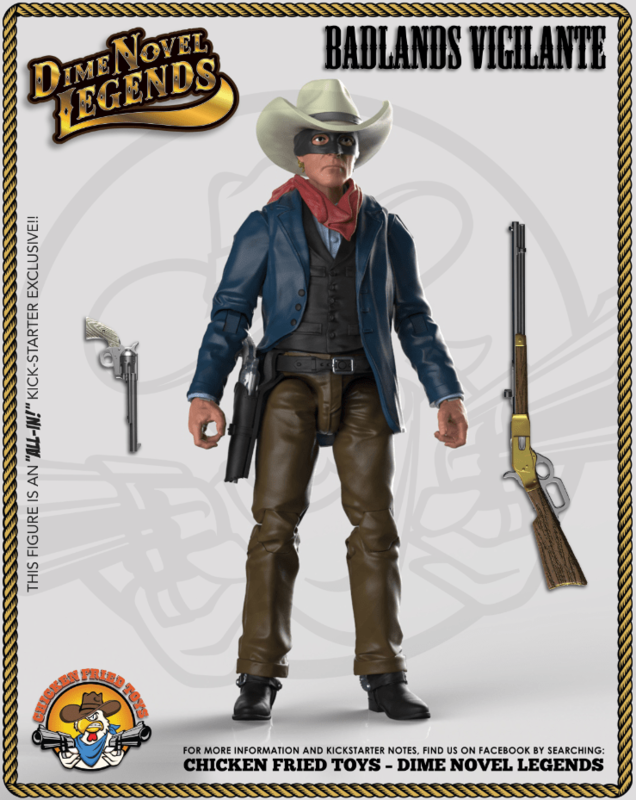 I won’t lie.. I’m crazy excited about seeing the Dime Novel Legends line become a reality. Maybe it’s the fact that I grew up at the end of the great western era of Hollywood, weaned on old re-runs of The Lone Ranger and Gunsmoke. (Badlands Vigilante anyone?) Maybe it’s the fact that my roommate and I obsessively watched Tombstone in college. (I can still quote whole scenes from memory.) Maybe it’s just the fact that the American Western is such an iconic part of our culture that has been largely ignored by the toy industry of late. Whatever the reason, THIS is the toy line that has me as excited as a six year old during his or her first visit to Toys R Us at Christmas. Whether it’s just a pledge of $25.00 for one of the single character options, the “gather your posse” for $115.00 or even the “All-In” at $450 or more– consider throwing your support behind this incredible line. Westerns are starting to enjoy a bit of a renaissance of late– with the latest take on the Magnificent Seven hitting the big screen and the new Westworld series captivating viewers each week on HBO. How bad@$$ would it be to be have the Dime Novel Legends as part of your figure displays? So mount up and head on over to Kickstarter and show your support today! This entry was posted in Fandom, Toys and tagged 1:18 scale, Badlands Vigilante, Broken Arrow Toys, Chicken Fried Toys, Dime Novel Legends, Kickstarter, Toys by Fred Meyer. Bookmark the permalink.